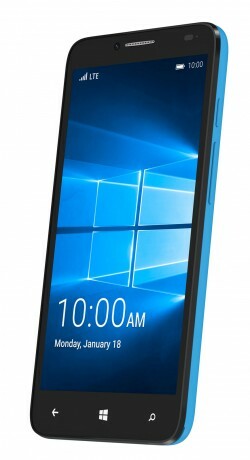 Alcatel today announced a Windows 10 variant of the Fierce XL smartphone. The phone is a direct carry over from the Android version, which was announced last year. The hardware features a 5.5-inch 720p HD screen, a 1.1GHz quad-core Snapdragon 210 processor with 2GB of RAM, and 16GB of storage. It supports memory cards up to 32GB. The main camera features an 8-megapixel sensor with flash and the front camera has a 2-megapixel sensor. The Fierce XL supports LTE 4G along with VoLTE, HD voice, and WiFi calling. Though it runs Windows 10, it does not support the Continuum feature. Alcatel said the Fierce XL will reach T-Mobile stores in a few weeks. T-Mobile will carry the phone in the months ahead. Pricing has yet to be determined. Alcatel said it will eventually make an unlocked version available to U.S. buyers via its web site. Alcatel ported Windows 10 to its Fierce XL handset and the result is a low-cost point of entry to Microsoft's ecosystem of productivity apps. The Fierce XL with Windows in a simple smartphone that impresses and bores at the same time. Making good on a promise it made last year, Alcatel has shown off its first Windows 10 smartphone. Rather than start from scratch, the copy repurposed the Fierce XL handset, swapping Android for Windows. Alcatel OneTouch today announced the Fierce XL, a budget phablet headed to MetroPCS and T-Mobile. The XL is the third Fierce-branded handset from Alcatel and features a 5.5-inch 720p HD screen. Alcatel today announced the Fierce 4, a large, budget-conscious Android smartphone that will be sold by MetroPCS. The Fierce 4 features a 5.5-inch 720p HD screen and is powered by a quad-core, 1.1 GHz Snapdragon 210 processor with 2 GB of RAM and 16 GB of storage.